I am a sucker for embroidery on clothes. If you ever take a look at my fashion inspiration board on Pinterest, you’ll notice a lot of clothes with embroidery. 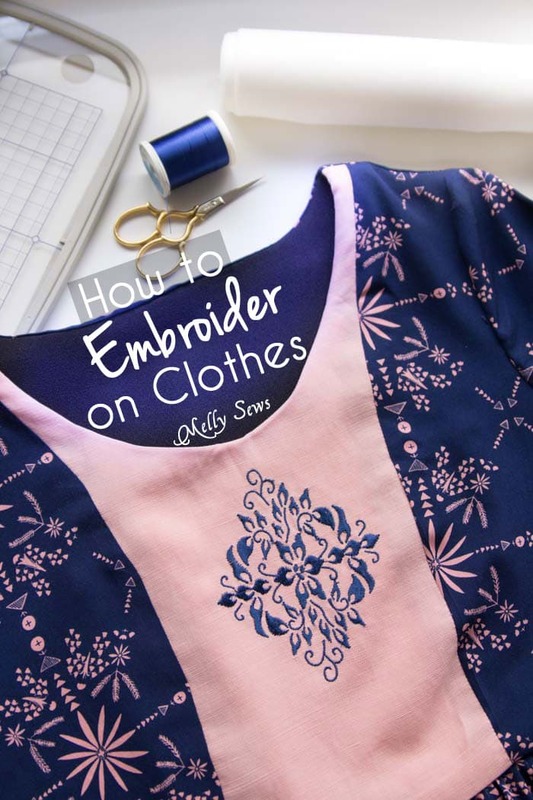 So I thought today I’d use the post to talk about how to embroider clothes, which is another way to play with this month’s theme of Embellish. 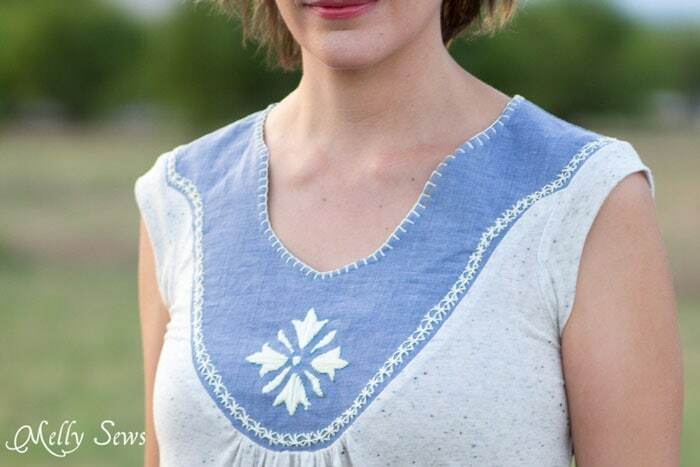 There are two basic ways to embroider – one is to do it by hand, and one is to do it by machine, and we’ll talk about both of those methods today. Embroidering by hand is the method that requires the least amount of tools and expense – basically just embroidery needles and thread. Lately I prefer to use pearl cotton (affiliate link), also known as perle cotton, because unlike the more common six strand embroidery floss (affiliate link), you don’t have to separate out strands to use. I also like the more rustic, handspun look of it and the fact that when used it has less sheen than embroidery floss. I did a video that covers the basic hand embroidery stitches; you can watch that below or read more in this post. 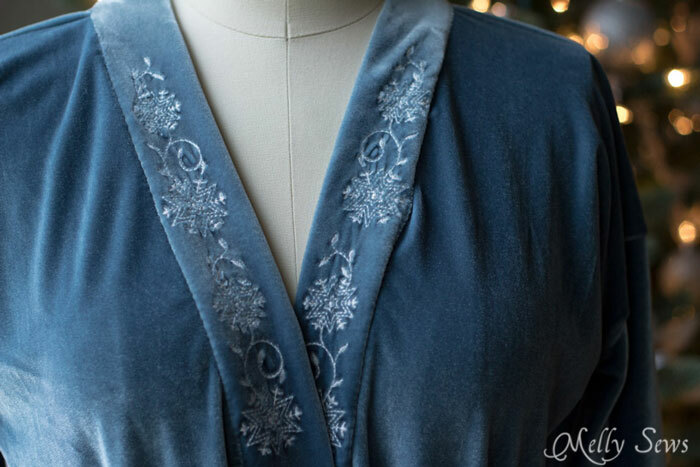 Because I want it to look a little imperfect, and because I’m often doing it on seamlines, etc, I tend to do hand embroidery on finished garments. 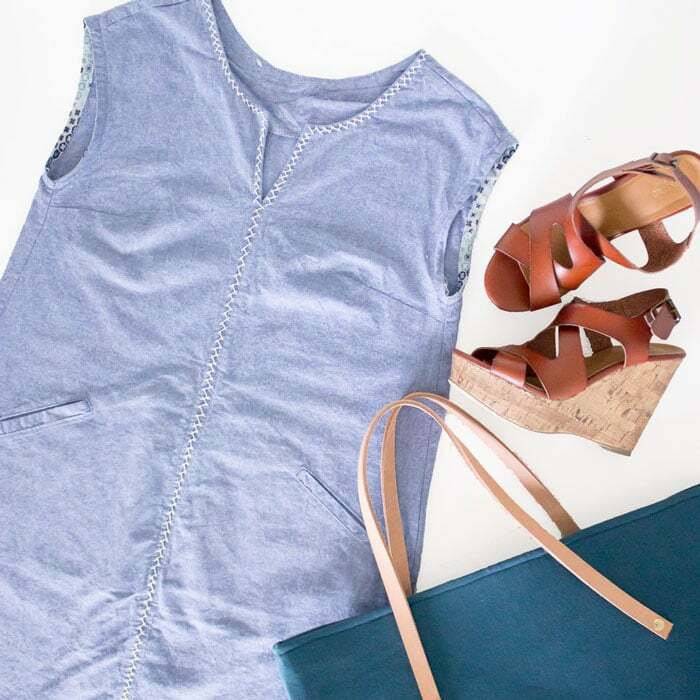 The Leralynn dress pictured above was done on a plane ride to where I planned to wear the dress. Machine embroidery, on the other hand, takes a lot more tools, starting with an embroidery machine or embroidery stitches on your sewing machine. I’m often asked to recommend sewing machines, and because I work with Baby Lock, I always recommend their machines. Check your local sewing machine dealer (you can find them here) and you can go in and try then out to see which best meets your needs. Other supplies for machine embroidery include stabilizer and embroidery thread. Stabilizer helps keep your fabric from puckering when you add all those needle pricks and all the thread from your embroidery design that wasn’t in the weave of the fabric to begin with. I’m not going to get into a full discussion of every kind of stabilizer, but I will tell you the ones I keep on hand. Fusible tear away stabilizer (affiliate link). This is my go to type stabilizer for most fabrics; it’s lightweight, easy to use, and easy to trim off the excess. Water soluble stabilizer (affiliate link). This is what I use for free standing lace. It also works well if you’re embroidering on a fabric with a raised nap (like velvet or fleece) to put it on top of the fabric and help the embroidery stand out from the fabric nap. The process of machine embroidery is to add stabilizer to your fabric, then hoop the fabric and stabilizer, insert the hoop in the embroidery machine, and then choose and stitch the design. Which means you’re limited by the size of the hoop your machine can accommodate and by the fact that you have to be able to get the part being embroidered flat in the hoop without the other side of the garment or object being behind it. The hardest part of machine embroidery is hooping; especially with clothes. 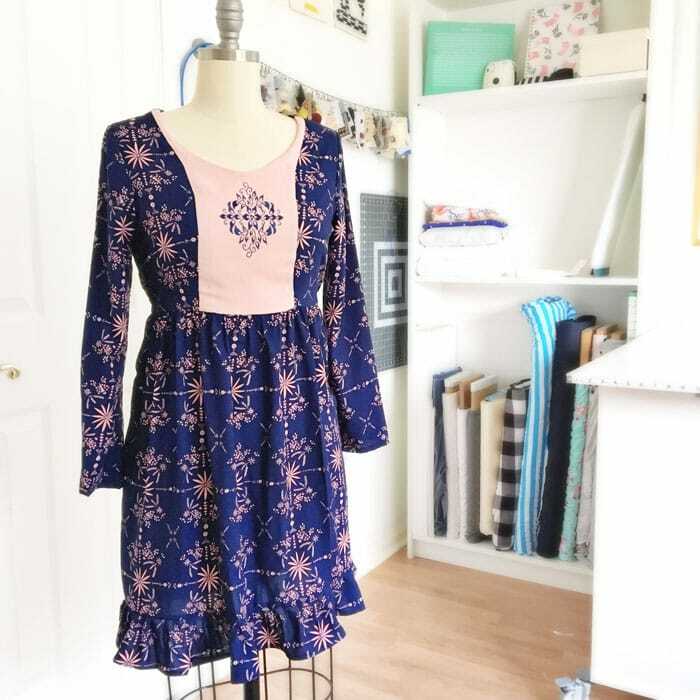 Because of this, I tend to trace out the pattern piece I’ll be adding the embroidery to on my fabric, but not cut it, then do the machine embroidery, then cut out the pattern piece so I can make sure my embroidery is perfectly centered. But even though I can move the cutting lines slightly to make sure a design is centered, it’s still important to make sure to hoop the fabric on grain, so that the pattern piece isn’t later off grain. and this Sabrina inspired top. For hand embroidery, I generally just make up my own designs and draw them with a disappearing ink pen on my fabric. But if you’re looking for designs already drawn, I like both my friend Bev’s store Flamingo Toes, and Sublime Stitching. For machine embroidery, I don’t have a particular designer or brand that I like, so I tend to browse the huge selection at Embroidery Designs and pick something. Or I use the embroidery designs that came programmed in my machine. Very helpful. 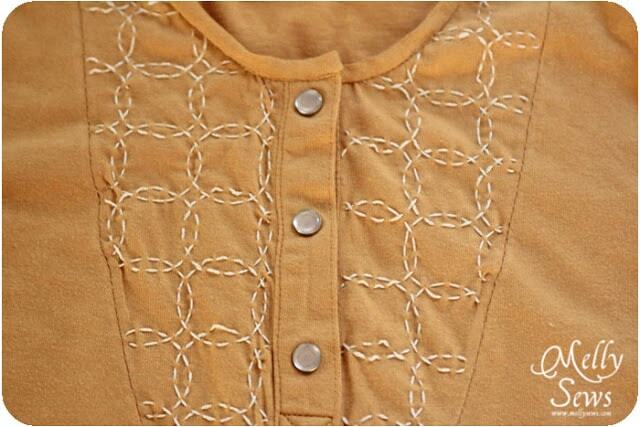 I want to make a couple of blouses then embellish them with embroidery or stitches from my sewing machine.